Just a heads-up. I'm going to be offline for a while. I'll post when I feel better. Sorry, I haven't had a chance yet to dig into it and see what's new, but it's ready and waiting for you over at mame.net. Ever vigilant, ever efficient, Marcus Tiller watches the ever elusive MAME release and keeps his "Universal Vertical Bezel" up to date (can you tell I'm running a high fever right now? ;-) Anyway, Univert has been updated to version .79, and can be downloaded from the Retroblast Files section. John's Retro Arcade: Cool Custom Gaming Electronics! I got an email from John Lundy pointing out his custom-designed circuit for interfacing a real pinball plunger with Visual Pinball. Not only that, but his web site, John's Retro Arcade, has a lot of other neat electronic "hacks" that he's invented for MAME cabinets, including an LED driver board, and an upcoming 4/8 way joystick circuit. Very cool stuff. I swear the Internet is a living, breathing entity, one that knows what I am doing and is hell-bent on thwarting my meager plans. Every time I try to post a new review, my ISP has an "issue," (such as, apparently, the new MyDoom virus) and I'm suddenly scrambling to find some other way to get back on the Net and get my files uploaded. (Luckily, at least my hosting service has been very reliable!) If you're reading this, then I've succeeded — enjoy the new articles! Updated update : My Internect connection (via cable modem) now back up (apparently, it was some sort of provisioning error.) All is well, at least until the "cable" light goes out again! 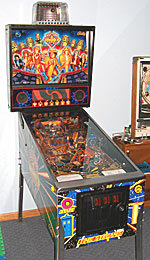 A new RetroBlast review, this time of the LED products available at SuperBrightLEDs.com. I finally wired up the coin door lights on the MAMEframe2, and I decided to use ultrabright LEDs for the lights. I ordered a number of different LED lamps to try out, everything from white to red to ultraviolet. Which LEDs did I decide on? Check out the review and see. 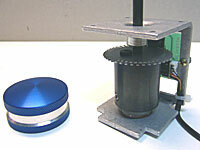 SlikStik Poll: Up/Down Tornado Spinner? The SlikStik crew have just posted a poll on their forums, asking if anyone is interested in a Tornado spinner with up/down movement added (such as the arcade) Discs of Tron spinner. If you're interested, go check out the poll and enter your opinion. It's looking like the next release of MAME may happen today, according to Aaron Giles' site and the Alt.Games.MAME newsgroup. The new memory routines Aaron has added to the MAME core seem to be working well, and only minor tweaks look to be added before the next MAME release. It looks like SlikStik has just announced their new single-player trackball and joystick units, and even posted a picture of the trackball unit on their site. If the photo is any indication, the new single player units will be just as sturdy (and hefty!) as the regular lineup of SlikStik products, and should make a great "desktop" gaming system. I'm still working on it, but it won't be ready for a few more weeks, as I'm adding a couple of more joysticks to the lineup: Ultimarc will be sending me the new production version of the T-Stik Plus joystick with new, quieter microswitches; and I'm waiting on a leaf-switch joystick from Centsible Amusements. This delay (yes, I know, one of many — sorry!) will give me a bit more time to refine my test criteria. I've got a few ideas for how to measure the pressure needed to move each joystick, but I've got to test them out to pick which one I'll use when testing. I've updated the MAMEframe2 Construction Diary with more hardware-related details, such as how I mounted the marquee. Not much, but it does pretty much wrap up the hardware side of the new cabinet. Next phase in the diary: details on the software setup and configuration. ATI Cards, a D9200, and the Act-Labs Light Gun? In my discussions with Andy Warne of Ultimarc, we've come across a possible new lead in tracking down why I've had such problems with the ACT-Labs light gun and the ArcadeVGA card. Seems it may be an issue with all ATI-based cards, not just the ArcadeVGA. So, I'm curious — is there anyone out there using an ATI card, a Wells-Gardner D9200 arcade monitor, and a light gun? How's it working? Any success or failure stories? Email me and let me know. Here's something I stumbled across today — a new joystick from Ultimarc. Actually, it's a new ball-top version of their T-Stik Plus, and features the same elegant "lift and twist" 4 way/8 way switching action as the regular T-Stik Plus. In addition, however, it has a traditional ball-top shaft, available in two lengths, one for metal control panels and one for wood control panels. (It's available in red now, with other colors in February). I love the easy 4/8 way switch on the regular T-Stik Plus, and the addition of a ball top shaft (with a version long enough for wood panels) makes this sound like a really great joystick. Just thought I'd put up a pic of how the SlikStik marquee looks installed in the SlikStik cab. It's a nice design, and it looks nice on the cab. All in all, it's a nice looking piece of work, and looks great backlit. I may just have to put it up as a "poster" next to the arcade game. I want to apologize for not making more progress on the Joystick Roundup review, but there is some good news to come out of the delays — I've ordered another joystick for the review. This time it's a leaf switch joystick from Centsible Amusements. I figured I needed another leaf switch-style joystick to compare to the original Wico already in the roundup. I'm still trying to figure out a way to accurately measure the force it takes to move each of these joysticks, so if you've got any ideas, please feel free to drop me a line with your suggestions! I have to apologize for all the broken links the last few days, but I finally think I've tracked down the problem links and have fixed them. Nothing a like site-wide change (like adding the "Search Site" button) to really mess things up! Hopefully everything's fixed — it seems so, but I thought that when I made the site changes the first time! I just finished up a review of MAMERoom.com's Virtual Music Jukebox Plans. If you're looking to build the ultimate gameroom companion accessory, this is probably it. It's a very unique design, a low-profile wall-mount system with an LCD screen. As usual, the plans are great. I just got another package from SlikStik, this one containing an updated Tornado spinner (with a black oxidized shaft and brand new custom encoder board), and a nifty new dual-color knob. The knob is a blue anodized knob, the same size as the original "standard" SlikStik knob, now with a "groove" in the center carved out, revealing the original aluminum. It also has a great new knurling pattern that's easy to grip (and doesn't feel like it's grinding away my fingertips!). The smooth center section seems ideal for Tempest spinning, allowing for easy "fingertip control," and I'm looking forward to trying it out. The new Tornado spinner is impressive, especially the new encoder board. It's tiny, and yet is PS2/USB switchable and has a socket to easily attach a cable for Left/Middle/Right mouse buttons! It's the same great Tornado spin, with brand new electronics. My favorite modern "retro-shooter" game, Mutant Storm, has just been updated to version 1.38, including support for a new level editor! Space Tripper, also by PomPom Games, has also been updated to version 1.83. Both are great 3D-acclerated arcade-style shooters, and highly recommended for a good adrenaline fix! 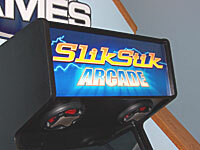 I just got my copy of the marquee that will be included with all SlikStik Arcade Cabinets — it's a very cool design. SlikStik is going to be using two 1/8" pieces of plexiglass for their cabinet marquee (instead of one 1/4" piece), which is a great decision, as it allows you to "sandwich" the marquee between the pieces of plexi to keep it flat. The SlikStik marquees are printed by the same company that I used to print my cab's custom marquee, namely ClassicArcadeGrafix.com. I've added a new picture of my custom marquee design (installed in the cab and lookin' good) to the Classic Arcade Grafix review. Well, I've been busy the last couple of days playing around in Photoshop, trying to get some nice looking instruction and information cards for my Doctor Who pinball machine. Since I don't have to have a pricing card on a machine that's set to Free Play, I've replaced the pricing card with one that details a bit of history about the machine. Click on the picture for a higher-resolution group of all three cards. I've gotten a lot of requests for the high-resolution Photoshop file I used to create the MAMEframe Instruction card. Well, the graphic is now available from the RetroBlast files page. The card was designed for a SlikStik Classic and MAMEWAH, but it can be easily modified to whatever you're using on your cab, as all the layers in the file are editable. Feel free to modify it however you need to. It looks like it's been a busy couple of weeks for the MAME development team — I noticed that all driver updates have been halted until the new core changes by Aaron Giles (who has been making amazing progress in emulating more recent arcade games that included a Voodoo2 GPU) have been incorporated into the main MAME code. It looks like this will change every single MAME driver, so this could be a substantial change. Who knows what this change will bring — better speed, robustness, or something else? All I know is that I'm looking forward to the next release! Now this is interesting — here is an announcement of a new type of video game gun, one that works with any display system: plasma, LCD, 100mhz TVs, and (gosh!) even regular PC monitors. Apparently, it uses some sort of motion sensor instead of the traditional light sensor, but details are really vauge, including how much this thing will cost. It may be my last, best hope for an arcade gun, since I have yet to get any of the available light guns working with the ArcadeVGA card in my arcade cab. I just saw a great post from Andy Warne of Ultimarc over on the BYOAC forums that mentions a lot of nice goodies coming this year, including a Mini-IPAC, and updated WinIPAC programming utility, and an IPAC X-Box interface. Very cool stuff. I received an interesting tip from "Orclord" over on the MAMEWorld Forums, mentioning that the ArcadeVGA card is compatible with SCART TVs. While SCART TVs are scarce to non-existent in the U.S., they are available in Europe, the UK, and Australia, and with the AVGA card they can be a very inexpensive option to an arcade monitor. Here's a page about using SCART TVs with MAME. Thanks, Orclord! Yes, Virginia, there is a Santa Claus — and he just dropped a finished review of the Ultimarc ArcadeVGA card in my lap! This particular review has been a long time in coming, but it's finally ready. Overall I like the card, but it took a bit of a battle to get things up and ready for "prime time." Still, I'm really glad I've got it installed in my arcade cab. Why? You can read the review here. ArcadeVGA M.A.M.E. Resolution Tool v1.0 Released! In an amazing display of synergy, the great ArcadeVGA tweaker that I mention in the just-released ArcadeVGA review has just had a big update to version 1.0! If you have an ArcadeVGA card, you need this utility. Great stuff, and it makes it a cinch to quickly fine-tune all of your MAME games for "arcade perfect" display. Grab it over at the MAMEWAH site. Thanks, Steve! The joypad is responsive, the twin battery packs guarantee that you'll never have to wait for a recharge, and it just works the way you'd expect it to. I'll be writing up a full review soon, but I can already safely say that I recommend this as a quick and easy way to add additional players to your arcade cabinet! And so begins another exciting year. Last year was a real growth year for retrogaming, with a lot of new companies and products. There are a lot of neat new products coming out this year (sorry I can't comment more, but trust me, cool stuff), and I'll be sure and try to review them ASAP. My apologies for not spending more time on the site over the last couple of weeks, but I've been doing extensive "gaming research" on my new Dr. Who pinball machine, trying to clean and tune it up (not to mention playing it for hours at a stretch!). There's something about having a real pinball machine that really brings back the "arcade experience" — perhaps it's all the flashing lights or the sound of the machine in action, but it's really taken me back. What Model D9200 Did You Get?